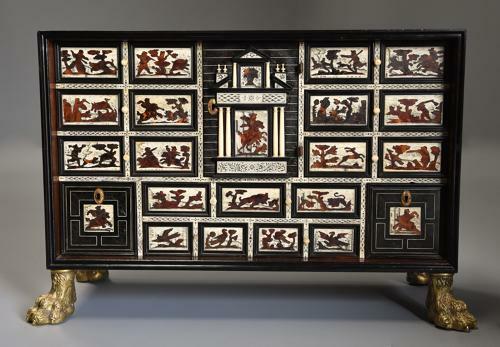 This cabinet consists of an arrangement of drawers with central door consisting of inlaid & engraved panels of ivory and tortoiseshell depicting hunting scenes with turned ivory knob handles. The cabinet consists of 3 drawers either side of the central door, each drawer consisting of two inlaid panels with engraved & stained ivory border. The central door of superb architectural design of broken pediment and columns with engraved & stained ivory panels on ebony ground engraved with birds with original brass escutcheon, lock and steel hinges. The door opens up to reveal two drawers, the top drawer consisting of two inlaid panels and the lower drawer consisting of four panels with applied brass rosettes and floral decoration. Below the door is a large central drawer consisting of seven inlaid panels with a square ebony inlaid drawer with inlaid panel to either side and brass escutcheons. The outer case constructed from exotic woods and inlaid decoration, all supported on later gilt hairy paw feet. This particular table cabinet is a rare example due to the unusual hunting scenes inlaid on the drawers and door. These types of cabinet were the height of fashion and status particularly in the 17th century: a work of art in their own right made with exotic materials of the time by superb craftsmen - storage for prized possessions and collections such as curiosities, gold and silver and other personal treasures. This cabinet is in excellent condition for age, is of stable construction and can go straight into a home or collection.